When the other ten heard this they began to feel indignant with James and John, so Jesus called them to him and said to them, ‘You know that among the pagans their so-called rulers lord it over them, and their great men make their authority felt. This is not to happen among you. No; anyone who wants to become great among you must be your servant, and anyone who wants to be first among you must be slave to all. For the Son of Man himself did not come to be served but to serve, and to give his life as a ransom for many. 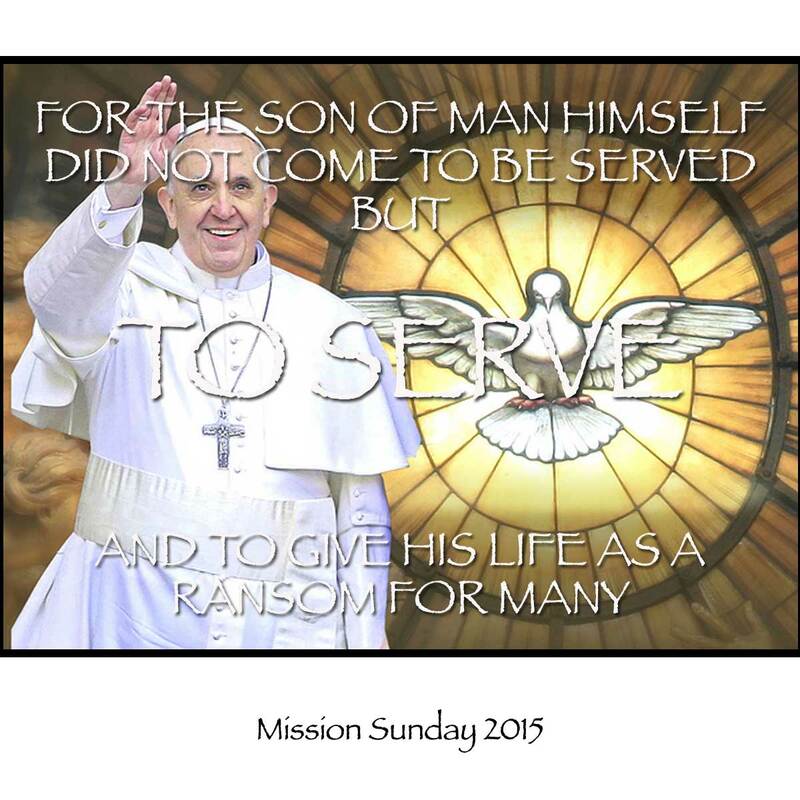 ‘I would like to encourage all, to become bearers of the good news of Christ ‘ (Pope Francis, (Mission Sunday 2013). Mission Sunday is the day we recall that we are all people on a mission, sent by the risen Lord to share in his love for the father, and to share this love with others. Many do this at home, as parents, family members, and in ordinary love and friendship. Others do so at home as parish ministers, chaplains in schools, hospitals and prisons, some as priests and religious, others as lay people. All are called with the pouring of baptismal water to be missionaries for Christ. Today however we remember in a special way our people – priests, religious and lay – who have gone abroad to work for countries much less prosperous than our own in schools, hospitals, with refugees, answering a call heard deep inside themselves to be men and women of Jesus Christ for others. They appreciate our prayers, our texts, our Skype calls and many ways of being in touch; they are dependent often on our financial contributions to keep our work going. Today is a day to remind ourselves of their good work, and the betterment of life they make in developing countries. May we never lose this hope to spread the love of God, and know that the people of the developing world give us joy in life and faith, that brings us in touch with the joy of giving a lot even when people have little. Send forth your Spirit O Lord, and renew the face of the earth. This entry was posted in Gospel of Mark, Gospel Reflection, Liturgy Resources, Prayer Resources, Scripture and tagged Christ, Donal Neary SJ, Good News, Gospel Reflection, Mission Sunday, missionaries for Christ, Missions, October 18th 2015, Pope Francis, Sunday Gospel Reading and Reflection for 18th October 2015.